Two anonymous donors are providing $3.4 million to create a new bursary endowment fund which will benefit generations of NSCAD students. The gifts were announced today by NSCAD President David B. Smith. At $2.4 million, one of the gifts represents the largest ever received in the University’s 125-year history. The second gift, also substantial, totals $1 million. Most of the money—$3 million—will go to create a bursary endowment fund. The remaining $400,000 will be used to boost recruitment efforts. Starting in the fall of 2013, the bursaries will be awarded to five students each year based on financial need and academic achievement. The bursaries, which will cover full tuition, will be renewable through all four years of education provided the recipient’s grade point average is maintained. At the direction of the donors, the bursaries will be named the “President David B. Smith Creative Excellence Awards” during the first year and every fifth year thereafter, in honour of Professor Smith’s many contributions during his presidency. During the other years, the bursaries will be known as the “Creative Innovators of Tomorrow Awards.” By the fourth year, there will be 20 students attending NSCAD—and each year afterwards—who will benefit from the endowment fund. “I’m deeply humbled by the donors’ generosity and gracious recognition of my legacy,” said Professor Smith. 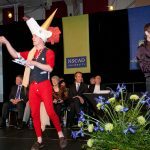 Michael Donovan, Chair of the NSCAD Board of Governors, said the gifts are a firm endorsement of NSCAD’s future during its 125th anniversary year.